Park Boulevard West condos are located at 525 11th Ave in San Diego. If you are looking for a condo in the downtown East Village District of San Diego then Park Boulevard West may be the place for you. Park Boulevard West was recently built in 2004 and is a gated and secure building that features one to two bedroom units with select Park Boulevard condos having rooftop terraces as well as underground parking. Homeowners association dues run $399/month for a prime location well situated building in the East Village area just blocks away from Petco with easy access to both I-5 and the 163 freeways. 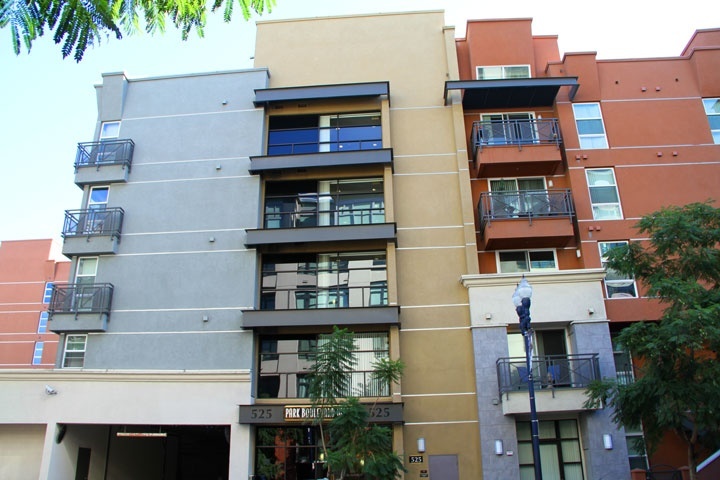 Below are the current Park Boulevard West downtown San Diego condos for sale. If you are looking for a downtown Park Boulevard West condo for rent please view below as all Park Boulevard West rentals are featured here. We also provide all sold Park Boulevard West condo sales at our San Diego Sold Search. All Park Boulevard West condos for sale are also listed below. Questions? Let our team of San Diego Realtor Associates help you. Please contact us at 1-888-990-7111 today.